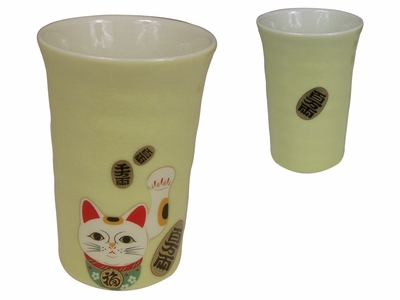 Made from Japan and crafted from fine ceramic, this eye-catching Japanese tea cup features a lucky cat also known as Maneki Neko raising it's left paw inviting fortune to come to their owner's businesses and customers. Use this cup to hold the many varieties of beverages you would like to enjoy at your house or your workplace. When looking closely at this cup you would notice subtle ridges or a wavy-like feel to this cup, most likely used as a grip when holding your lovely cup. The color of this cup consists of a pale yellow on the outside, and an off white with a mild hint of yellow to it. The cup has a very special effect to it with a crackle design all throughout the cup giving it a noticeable look to it. On one side of the cup there is a white spotted brown and black lucky cat with red ears raising it's left paw up beckoning for fortune your way. Next to the lucky cat there are three coins, the biggest one means 1 million, the second biggest mean 10 million, and the smallest means 100,000 in Japanese currency. On the other side of the cup you would notice three of the same coins all right next to each other. With all these coins this Japanese tea cup would clearly bring fortune to your way in the businesses you decide to participate in. This cup is finished with a smooth and glossy glaze. Bring this Japanese tea cup home and share the fortune with your family and friends. Make sure to check out the other colors it comes it for a different variety!